Whether your boat is powered by an outboard, an inboard-outboard or a diesel, there will be engine hazards. Anything that has moving parts requires oil and gas and gets hot under load will create potential engine hazards. 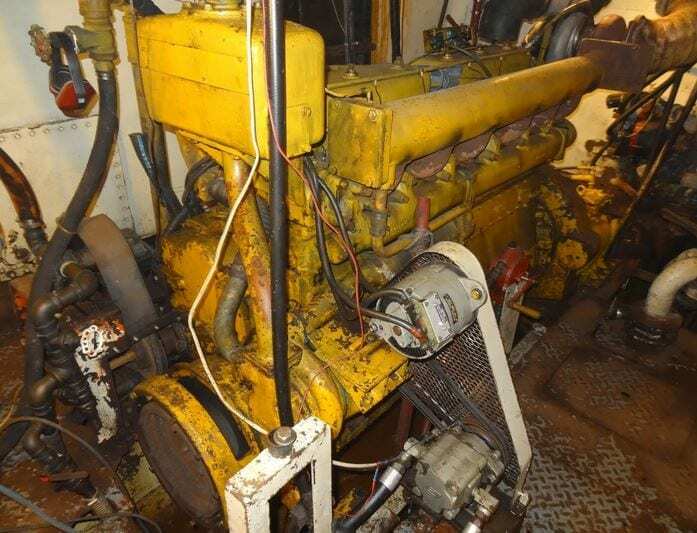 When an engine is housed in an engine room, like most diesel-powered boats, the hazard increases due to confined space. That risk is with the addition of generators, pumps, electrical equipment, and batteries. Additionally, the risk for hazards increases dramatically if the room is also used for storage. Whatever type of engine powers your boat, the first thing on the list is to keep the area around it clean. One of the greatest fears onboard and the most obvious danger in the engine room is fire. It’s a life-threatening event, but fire is a result, not a hazard. Fuel, oil, lubricants, air (oxygen), and the hot surfaces associated with the machinery create a highly combustible situation. 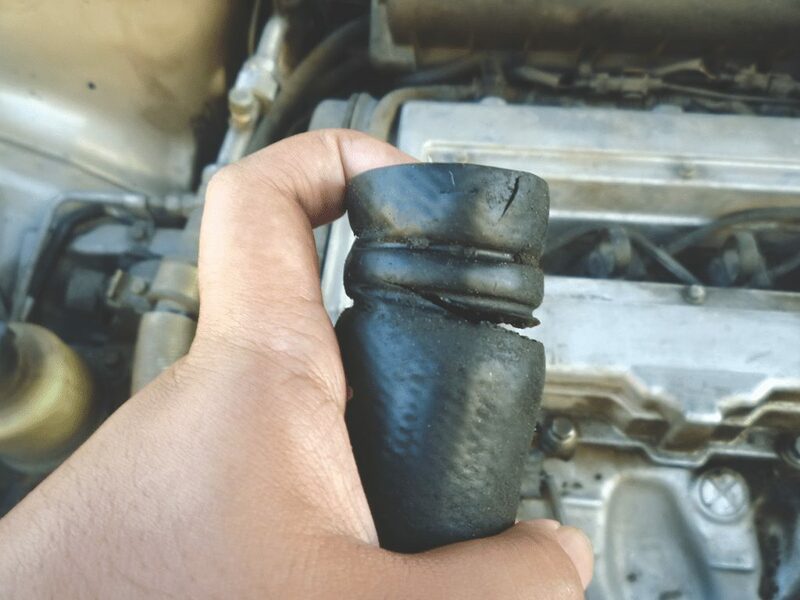 A broken hose can lead to additional engine hazards. When inspecting the engine, generator, and steering system, check for cracks or signs of leakage in and around the fuel and hydraulic hoses. “There’s a potential for fire danger from a high-pressure fuel leak on the engine or from high-pressure oil in your hydraulic system finding a hot point in the engine room and flashing off,” says McErlane. It’s also important to check the raw water cooling hoses. Ruptured seawater lines can cause severe short-circuiting and arching in electric motors (alternators), electrical panels and other exposed electrical equipment, which can cause a fire. Even though hoses looked good at the beginning of the season, their condition from sitting for an extended period of time can change after they’re used. Batteries are also a fire hazard. Because they are consistently under a charge, they can overheat as they age. 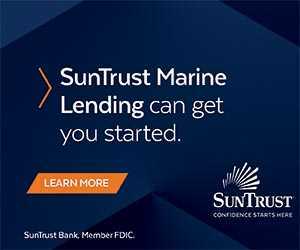 “When batteries are charging, they [can] emit hydrogen, a highly flammable gas that is potentially explosive,” states the U.S. Coast Guard’s Boat Crew Seamanship Manual. A battery’s lifespan is between two and four years, and McErlane suggests the owner/operator replace it at around three years. 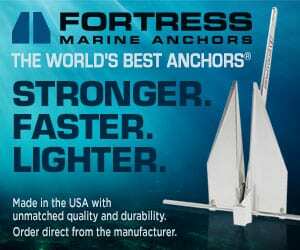 Also, be sure a marine-rated battery charger is used. It will turn off or go into “float” mode when the batteries are full. Never use an automobile battery charger. Keep oil and grease out of bilges. Clean up any spilled fuel or lube oil immediately and properly dispose of it on shore. Stow cleaning materials off the boat. Keep all areas free of waste material. Use proper containers for flammable liquids. Be alert for suspicious odors and fumes, and vent all spaces thoroughly before starting the engine(s). Besides fire, flooding can also put your life at risk. 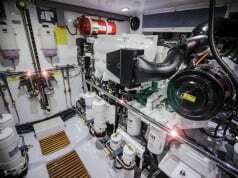 Seawater is pumped in to cool the engine, generator and air-conditioning systems. Where are your thru-hulls are located? Do the valves shut off? 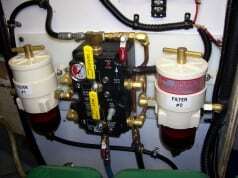 Do your bilge pumps work? How about the floats? Did you check? “Seawater is corrosive and more aggressive on metal fittings,” says McErlane. It’s important to check the condition of the hoses and connections that carry the water to various bits of machinery. “Every ten years, rubber hoses should be replaced,” McErlane adds. And don’t forget your propeller shaft seals. Whether your boat utilizes a stuffing box, face seals or lip seals, they all use raw water for lubrication, and the hoses providing the water flow also need inspection. Remember, seawater and electrical connections don’t mix. Now that it’s creeping into late summer and the boat’s been in the water for a few months, it’s important to be aware of some hazards that may not be life-threatening but can cause serious problems. Marine growth can restrict water flow in the boat’s cooling systems. It’s not so much a problem in the engine’s heat exchanger or generator because the water isn’t sitting in the piping, but it can affect an air-conditioning system that runs constantly or sits below the waterline. If the system cycles on and off more often than usual, it might be time for a cleaning.